Mom has been a flurry of activity since Monday preparing for two cowboy dinners. Her stove's been hot and cookin' since Sunday! We had the second dinner this evening. I think this dinner was more exciting than the first one due to the guests! A lively crowd makes for good company. Amelia and I have pretty much stayed home since our excursion on Sunday. We've rested and tried to catch up on sleep plus help Mom cook up a storm. 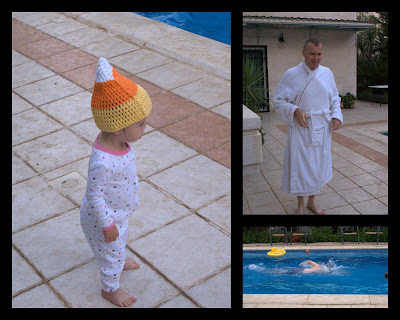 This morning Amelia followed Grandpa Lane out to the swimming pool to watch him morph into a Polar Bear. The pool water is a frosty 65-68 degrees. Jumping in is the only way to get in this pool! She watched him swim with great interest. The funniest part (for me) was her outfit...in her jammies wearing a candy corn hat she pulled out of her drawer! My good friend, Shannon, picked us up this morning to ferry us to a local play group. 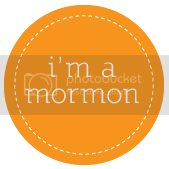 I served two months of my mission with Shannon down in Loule, Portugal. She is a wonderful person!!! Amelia seemed delighted to play with toys that whirled and wizzed, clicked and buzzed. Grandma mostly has cool pans to bang, new toys were a definite draw. 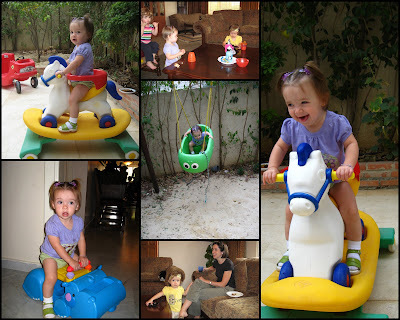 She loved the horsey ride on the porch! I had fun getting to know some of the ladies and their kids from the American Embassy.